Words can't describe this sofa, it is gorgeously commanding and deserves to be the center of attention in your living room. This beauty is tall, tufted, and curvy! 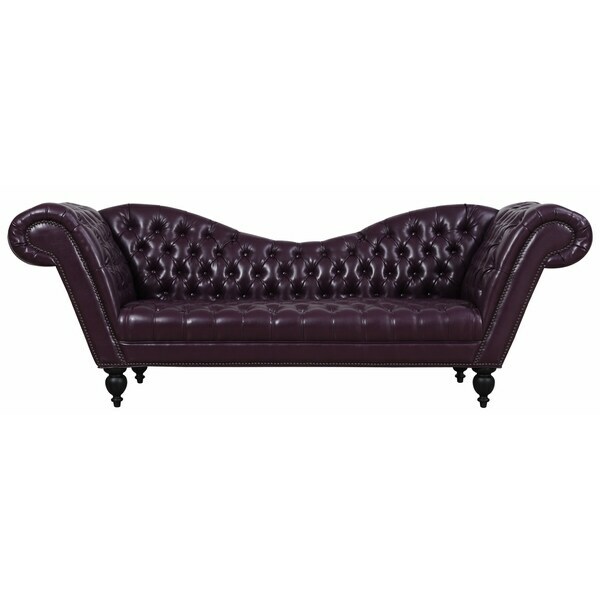 The deep eggplant shaded bonded leather upholstery is accented with hand-applied nail head trim and deep tufts on the seat and back. The curved design adds elegance to any room. Please note:Orders of 151-pounds or more will be shipped via Freight carrier and our Oversized Item Delivery/Return policy will apply.Please click here for more information. Absolutely love the couch. However the bonded leather looks like vinyl. The quality just isn't there. But I have it and it goes in my living room perfectly where no one sits that much.